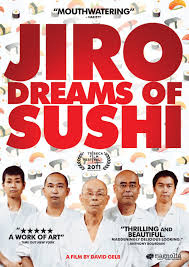 Jiro Dreams of Sushi is the story of 85-year-old Jiro Ono, considered by many to be the world's greatest sushi chef. He is the proprietor of Sukiyabashi Jiro, a 10-seat, sushi-only restaurant inauspiciously located in a Tokyo subway station. Despite its humble appearances, it is the first restaurant of its kind to be awarded a prestigious three-star Michelin Guide rating, and sushi lovers from around the globe make repeated pilgrimage, calling months in advance and shelling out top dollar for a coveted seat at Jiro's sushi bar. Jiro Dreams of Sushi is a thoughtful and elegant meditation on work, family, and the art of perfection, chronicling Jiro's life as both an unparalleled success in the culinary world and as a loving yet complicated father.